It’s a crucial component in any laptop or desktop computer, but very few computer owners actually know what a motherboard is or what it does. There’s a motherboard (often called a logic board in smaller more mobile devices) sitting in every computer system: the processor, RAM, hard drives, graphics card, and other bits and pieces all plug straight into it. The motherboard makes sure all those components are speaking the same language and that the system all runs together properly, without any sparks or grating noises. Think of it like the nervous system or circulatory system of the computer. It’s complexity is further hindered by all the confusing terms and acronyms applied to its components. This can make understanding the motherboard really difficult, and it can make trying to purchase your own damn near impossible for someone new to computer building or repair. 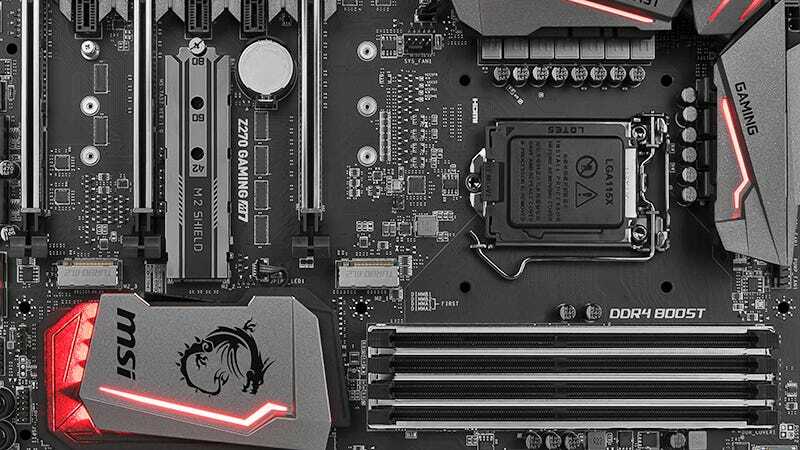 To help with that we’ve done our best to explain the major components of the motherboard, as well as the most common terms and biggest key features. Can you hook up a USB 3.0 external drive to your computer? Or slot in the fastest type of RAM available? It’s your motherboard that determines the answers to those questions and other ones like them, and if you open up your computer case them you’ll see a lot of slots, connectors and wiring keeping everything linked up. The RAM slots are usually close to the CPU socket and will be some of the longest slots on the board. Slots for a graphics card (or two) are typically on the other side, allowing for the graphics card input and output ports to stick out the back of your computer case. Other similar slots handle extras like sound cards or dedicated video capture cards. Your motherboard will have a host of outward-facing input and output ports, like USB and HDMI, letting you hook up peripherals and displays and so on. Peer inside your computer and you’ll see some internal ones as well, such as the motherboard sockets linked to whatever hard drives you’ve got installed: when drives evolved from the older Parallel ATA (PATA) standard to the newer Serial ATA (SATA) standard, motherboards had to be redesigned and reconfigured to cope. It’s those sorts of changes that end users usually never think about, but which enable key features like being able to have a super-fast SSD inside your laptop. All of these electronics need to be powered too, and again your choice of motherboard determines your choice of power supply and just how much juice the system can handle at once as well as whether or not you can push the limits with some CPU overclocking. What makes motherboard specs potentially so confusing is that the technology behind all of these sockets—SATA for hard drives, PCI Express for graphics cards, DDR for RAM, and so on—is improving all the time. While there’s a lot of backwards compatibility involved, if you want the newest memory sticks or graphics card to offer the maximum performance for your system, you need a motherboard that can cope with the newest standards as well as the right kit to plug into it. There are three generations and counting of SATA technology, for instance, affecting the maximum data transfer speeds, while the latest M.2 connector found on many a modern board is designed to take a new, faster, SSD drive or the even new 3D Xpoint-based Optane memory. As with the CPU and RAM sockets, it’s not the sockets themselves that affect the performance to any great extent, it’s the stuff you plug into them—so unless you’re building your own system you can focus on the main computer specs like CPU-type and RAM type rather than the motherboard. The headline feature of a motherboard is its CPU socket, indicating the type of processor that it’s compatible with. Motherboards are designed with their socket type in mind and if you’re building your own system then you need to look for this first. Certain sockets will usually be compatible with a group or family of processors. For example, for almost all the newest Kaby Lake CPUs from Intel, you need an LGA 1151 socket motherboard; for the new Intel X-series you need a LGA 2066 socket; for the majority of the newest AMD Ryzen CPUs, meanwhile, you need an AM4 socket board. The socket is the square-ish bracket somewhere around the center of the board, filled with small pins or holes, and shouldn’t be too difficult to spot. Then there’s the motherboard chipset, the on-board electronics that give the component some brains of its own (though the CPU will be doing most of the thinking for your system). Essentially, the chipset handles communications to and from the CPU—controlling how many other components can talk to the CPU at once, and how quickly. Traditionally the chipset has been split into a northbridge and a southbridge, responsible for communications with different components. The northbridge would handle the CPU, RAM and PCI slots (which you plug a GPU into) and the southbridge would handle...practically every other port. Yet the modern trend of the last few years is for the northbridge—handling the most important and fastest tasks—to be effectively built into the CPU architecture itself to improve efficiency across the board. That means a computer build is even more dependent on your CPU choice than ever before. While the choice of motherboard doesn’t have much of an effect on how fast or smoothly your computer runs when compared to the processor and RAM, it does determine which components you can connect up together and thus what type of a system you get at the other end. If the motherboard only has two sockets available for RAM you’ll be limited in how much you can install. Plus, if you think you might want to upgrade a component or two in the future, that future-proofing also depends on the specs of the board. Don’t by a Thunderbolt-less board now if you think you’ll want to embrace the protocol in the near future. Motherboards can be broadly split up into several shapes and sizes known as form factors. The six most common types are (from biggest to smallest) ATX, Micro-ATX, Flex-ATX, DTX, and Mini-ITX. All the size and shape of your board really dictates is how many extra cards and peripherals you can plug into it, and what shape of case can fit around it. ATX boards are suitable for big gaming rigs that need a lot of room, whereas Mini-ITX is better for a compact, home theater system that’s going under the TV. Laptops will have motherboards shaped and designed specifically for the computer they’re going in—the key features and specs are all the same, but the manufacturer builds them as one part of an overall whole, designed to keep power use and weight down and optimize communications between the other parts of the notebook. Asus Zephyrus Review: Has the Age of Powerful and Convenient Gaming Laptops Finally Arrived? That’s partly why upgrading a laptop is a fiddly business that’s often not worth your time, apart from perhaps the RAM and hard drive. Upgrading the motherboard on a laptop is pretty much out of the question. Yet it can be done—with a lot of time and effort—on any desktop computer, if you’ve got the technical know-how. You’re basically unplugging everything that makes up your system, swapping out the main board, then plugging everything in again.